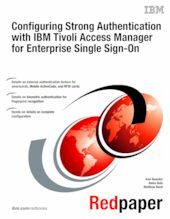 IBM® Tivoli® Access Manager for Enterprise Single Sign-On automates sign-on and access to enterprise applications, eliminating the need to remember and manage user names and passwords. Users log on to Tivoli Access Manager for Enterprise Single Sign-On with a special user ID and password, and then, when they access their secured applications, the Tivoli Access Manager for Enterprise Single Sign-On agent enters their stored credentials automatically without the users needing to do so. Tivoli Access Manager for Enterprise Single Sign-On provides the usual features associated with password security, for example, password length, aging policy, and so forth. This IBM Redpapers™ publication is based on a set of exercises that was produced for the European Tivoli Technical Conference 2010. It shows how to configure Tivoli Access Manager for Enterprise Single Sign-On to use additional or alternative methods of authentication when users log on to provide a greater degree of security (stronger authentication). This paper is intended to complement the product documentation and should be read in conjunction with it. In particular, you should refer to the Setup Guide.